Australopithecus aethiopicus is categorised into a group known as the robust australopithecines. The robust australopithecines are split into three species, Australopithecus aethiopicus, Australopithecus robustus, and Australopithecus boisei. There has been an ongoing debate over the exact phyletic origins of each of these species. The robust australopithecines share many characteristics of the cranium and mandible, perhaps suggesting a shared evolutionary development. Circa 2 500 000 BP. Cranium with no lower jaw, West Turkana, Kenya. Known as the 'Black Skull' due to the dark coloration of the bone, caused by high levels of manganese in the deposit. Cranium with no lower jaw, West Turkana, Kenya. 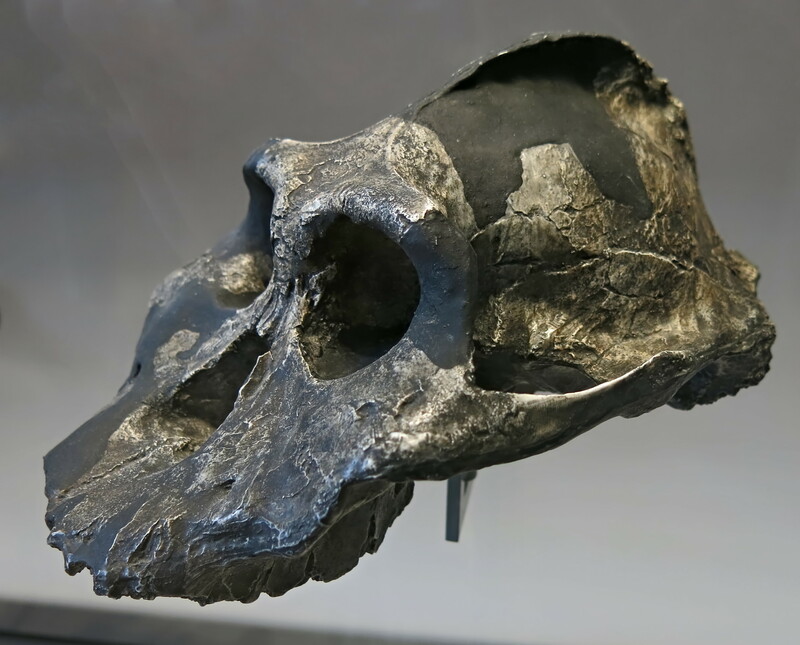 Paranthropus aethiopicus is considered a megadont archaic hominin, the term megadont referring to the huge size of the postcanine tooth crowns. The initial discovery was a toothless adult mandible in the Shungura formation of the Omo region of Ethiopia in 1967 (Omo 18.18). The ash layers above and below the fossils give an approximate date of 2 500 000 BP - 2 300 000 BP. There is only one mostly complete skull for this hominin, so it is hard to make proper inferences about physical characteristics. 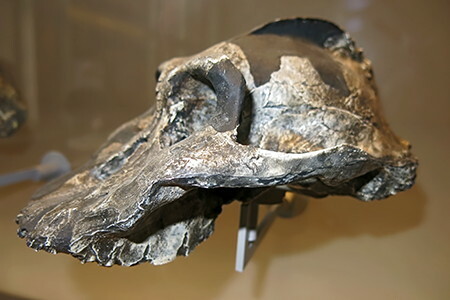 However, it can be said that the available skull is similar to Paranthropus boisei, although the incisors are larger, the face more prognathic (projecting), and the cranial base less flexed. 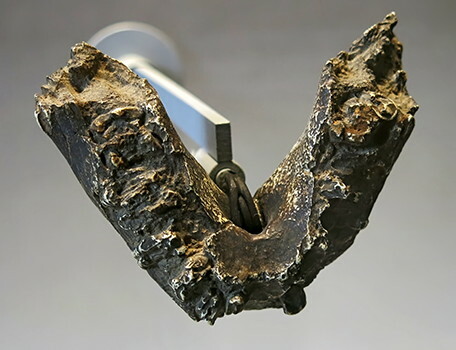 Australopithecus aethiopicus has notable features that differ from the other robust australopithecines, including a larger zygomatic arch, extended ramus of the mandible, and a more prognathic face. These differences may have been developed during the evolution of aethiopicus, but it may also suggest that Australopithecus aethiopicus has a different phylogenetic history than Australopithecus robustus and Australopithecus boisei. Australopithecus aethiopicus, type specimen, OMO 18-1967-18. Circa 2 600 000 BP. Paranthropus aethiopicus was first proposed in 1967 to describe a toothless partial mandible (Omo 18) found in Ethiopia by French palaeontologists. Lower jaw and teeth fragments have been uncovered. Paranthropus aethiopicus had a large sagittal crest and zygomatic arch adapted for heavy chewing (as in gorilla skulls). Not much is known about this species since the best evidence comes from the 'Black Skull' and this jaw. There is not enough material to make an assessment of how tall they were, but they may have been as tall as Australopithecus afarensis. 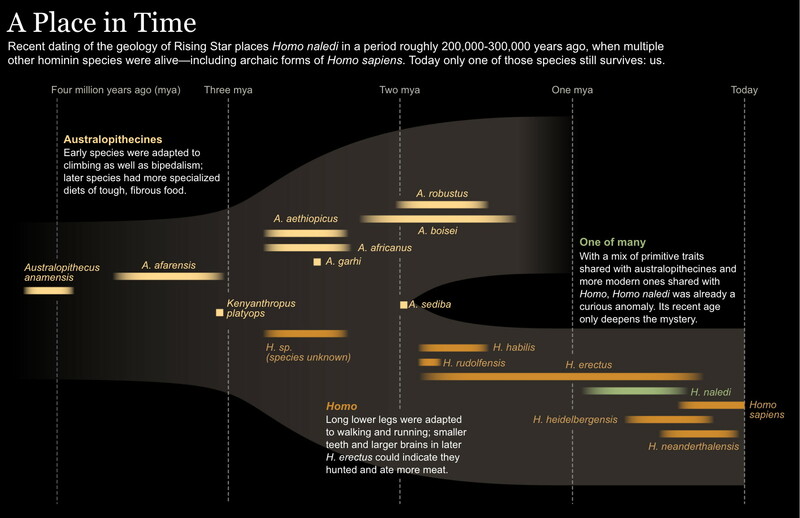 Note that Homo floresiensis has not been placed on this timeline. van den Bergh et al. (2016) indicate that it may be a form of Homo erectus. Kimbel, W., Johanson, D., and Rak, Y., 1994: The first skull and other new discoveries of Australopithecus afarensis at Hadar, EthiopiaNature, 368: 449-451. 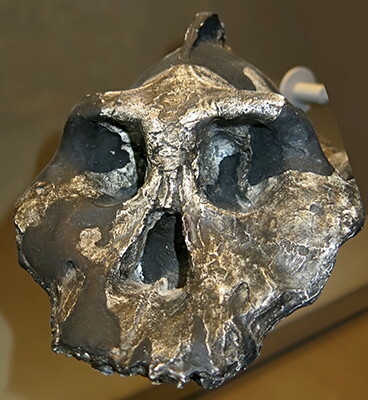 Kimbel, W., Rak, Y., and Johanson, D. , 2004: The skull of Australopithecus afarensis, New York: Oxford University Press. van den Bergh G. et al., 2016: Homo floresiensis-like fossils from the early Middle Pleistocene of Flores, Nature, 534 (7606): 245–248. doi:10.1038/nature17999. PMID 27279221.